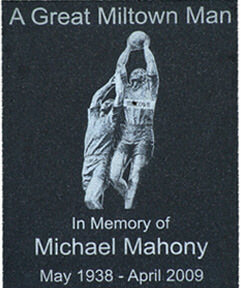 A plaque is a permanent and constant reminder of a great local legend, event or historic occasion. 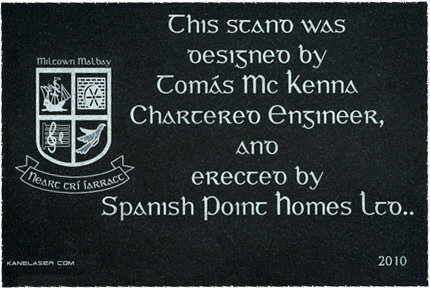 At Kane Laser, we can engrave text and image or any combination as required on to a variety of materials. Images can be scanned from photographs or taken direct from digital images. We also clean and edit your images and remove distracting background as required. All images will be returned. 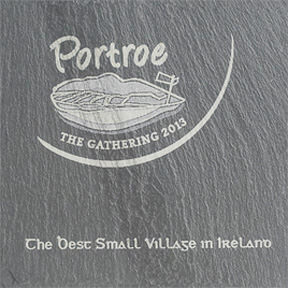 This set of commemorative slate coasters was specially commissioned by Portroe village as a gift for those who attended their celebrations for The Gathering in 2013. 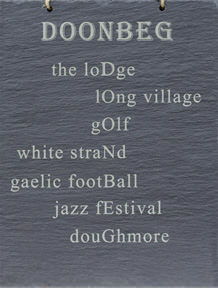 On the occasion of Donald Trump acquiring Doonbeg Golf club, we created this "Acrostic name poem" engraved on slate of the area so he would have an idea of what a beautiful area he had bought into and also encourage him to visit! We can create a design for you or work from your own idea. Contact us today to discuss your requirements. If we can't do it, we can tell you who can! Call us on 0872555391 or email us to discuss your requirements.